Game is Life, and Life is a Journey to Game. You are a fantastic fan of online games. Have you ever heard of Minecraft games online? Do you like strategy or architecture-like games? Do you know Lego game with its colorful blocks? Are you really addicted to Lego and its wonderful blocks? I will not waste your time much! 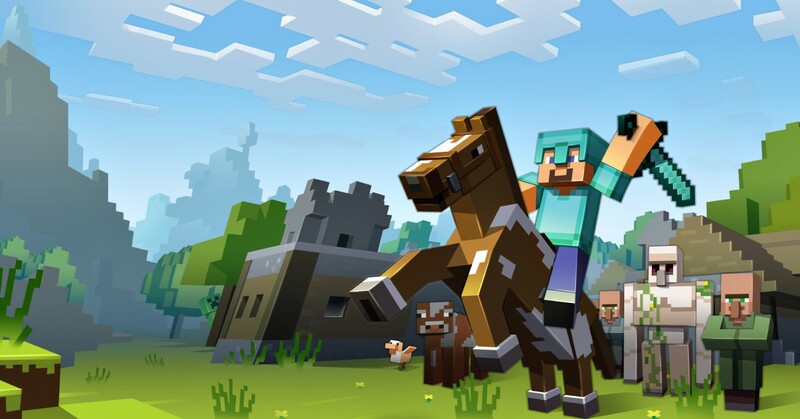 If you are the first time coming to Minecraft – the biggest and most influential game community, it will be surely a big problem to miss Minecraft 2d, my favorite when I started to play 2d Minecraft games online for free on PC with some of my close friends. In fact, this is where to take the first steps into familiar feelings of putting blocks and creating the buildings. What the most attractive advantages of Minecraft 2d game online? First, let’s take a look at the gameplay. An empty world appears in front of players, which is obviously the perfect environment to generate your plans on what to build and how to put blocks in what order. 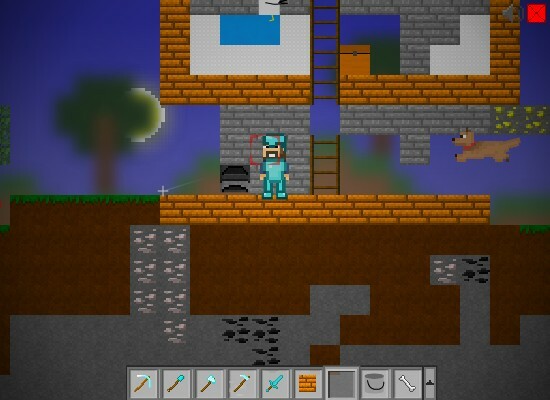 Besides, there are a lot of blocks under the main character which the players can take advantage of in order to mine them for free and create something special for the house or building, like basement, storage, or a free room. Second, if you’re not interested in mining blocks or crafting items for the building, this game is for you. Why to say so? 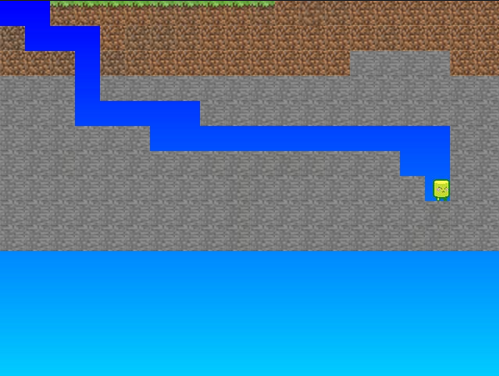 It is because this unique type of 2d Minecraft games will not require any mission of such above; instead, it offers all different kinds of blocks needed for the process. The most important task is to hold each key from Z, X, C, V, B, N, and M together with clicking the left mouse so as to show up each blocks in turn, including wooden planks, wood blocks, sand, TNT, or coal. It is really great, right? Lastly, it is time for you to make tactics on what blocks to put first and how to make your house beautiful. Do not ignore this step as all of your achievements will rely on this much. Think of it carefully. Do not forget that the game zone is limited. Do not let the main character fall down without any place to stand on. Otherwise, he will die, and the game is over. Now, it is the right moment to give Minecraft 2d game a try and share with us your own achievement. Minecraft 2d Mine Blocks Series – How To Be A Winner? Do you want to play something that can help you enhance your own skills and creativeness? Are you looking for that place? Have you ever heard about Mine Blocks series in 2d Minecraft? To be known as the most wonderful creative games in the Minecraft world, it’s certain that you are able to receive and explore tons of terrific things here. I’m sure that you will be impressed when visiting the most fantastic world. It’s time for you to become a great creator, designer, architect or engineer. Be ready to be a winner in this world? Here we are! Actually, you can search for various versions of Mine Blocks games as Mine Blocks 1.26.2, 1.25, 1.23, 1.26.4, and so on. Of course, all of the versions have the same requests; that is, players need to create a new appearance for this land. However, they can explore some different when enjoying each different version. Just play to know, guys! 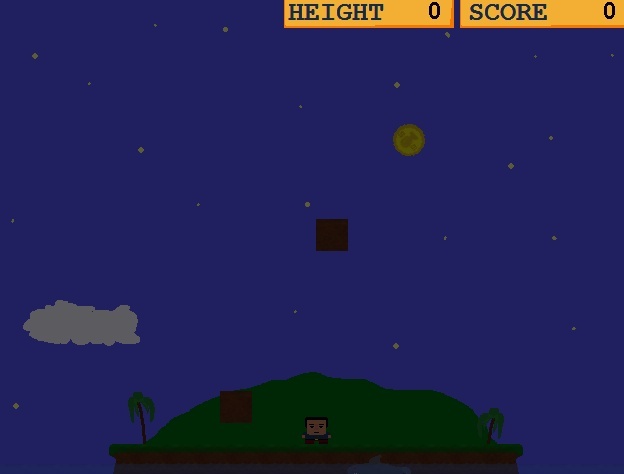 Normally, the players are required to create the first-night house for Steve (a main character). Start guiding him to move around the world and seek for necessary blocks. Don’t worry too much because this world is full of cool blocks such as irons, rocks, stones, dirt, wood, sand, etc. Just hold the mouse to mine the blocks and then place them into an Inventory. Next, continue looking for an ideal place to help Steve build the house and guide him to stay here every night. Especially, don’t forget to open the Inventory and learn to craft some necessary tools and weapons. These items are to support Steve to build more spectacular structures as well as preventing creatures’ attacks. It can be said that playing Mine Blocks games is a long journey that the players need to have enough patience to do. Besides, in case that you want to receive more fun, don’t mind diving into the ocean or into the ground to make awesome castles from the water and earth. It’s such a cool idea, isn’t it? Give a try and see what you can do. Try to open your imagination and creativeness to combine the normal blocks for the wonderful final result. Be quick to display everything in the 2d Minecraft games world! To tell the truth, there is no winner in this game. Almost the players just play because they want to develop their creativity through building the structures. So, be free and relaxed when forming whatever you want. Here will be a very awesome place that you can do without worrying anything. Spend you free time and relish now, guys! Every moment I play Minecraft games on 2d Minecraft, I have different feelings. Sometime, I’m excited, sometimes I’m confused, and sometimes I’m impatient and just want to win all challenges ahead. That is why I want to share my cool feelings with anyone who loves playing games like me. I think lots of you used to be in that case. We never want to give up or lose any level. Falling Blocks has made me sleepless many months. I can’t beat it even I tried plenty of ways. Let’s go and check how you can do. Have you ever been addicted to any game? Play Games Like Minecraft On 2d Minecraft and see. The more Minecraft games you play, it is certain that the much more you love them. Do you want to know the reason why you are interested in them? It is their excitements and attractions. Don’t need to wait anymore. Let’s enjoy the most sophisticated and exciting game – Falling Blocks to start reveling in challenges as well as fantasies. Remember that the game is tough to beat. Once your game controlling skills are well, you can have the hope. Ok, go and find out how hard it is. Players will go to a small island but very nice. When they put their feet on the ground of the island, the darkness covers, and all becomes dreadful. They cannot see anything clearly. The urgent task is to find a young boy who is being trapped here some days ago. Look! The scene around the island is very terrible. I feel like we are in a creepy world full of ghosts. Hurry up to aid him to get out of it soon. It all is up to you, guys. The more intelligent you are, the safer the young boy is. Come on and see how you can rescue him while a series of blocks is falling off the island everywhere. The best way is to bring him through these falling blocks and get the exit. Along the way, never let any block drop on him, or he dies. The players have to pick up all gold coins while moving out to get lots of points. Remember that hungry sharks often swim around the shore to eat the boy. Be watchful for them! Hope you can help him survive until reaching the gate. Have fun and good luck on this 2d Minecraft game, guys! The arrow keys are to move. Spacebar is to jump. How do you feel when listening to the rhythm of the rain? If you have yet to hear it in a quiet place, take your time to revel in great melodies. Once you have already walked under the rain and try to hear its sound, it is sure that you want to dip yourself into that wonderful rhythm and never want to get out of that great feeling. It seems that the rhythm of the rain shows you the silence without being busy. The life is so beautiful with it. However, you sometimes hear it. 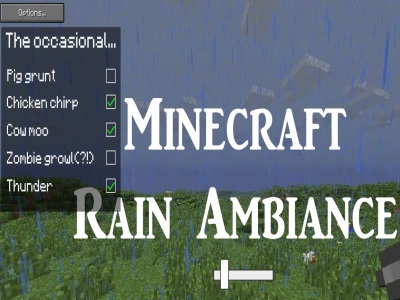 Minecraft knew that and that is why today it creates 2d Minecraft Rain Ambiance Ver 1.1 to help fans who love rain. Come on and do not miss out on hearing how different the sound of the rain in this game from the reality. When opening the game, players will be surprised at a beautiful landscape and a cool sound of the rain. Close your eyes and feel it, guys. It is like you are flying in the sky without worrying about anything in your life. The players can adjust the volume by press the volume bar at the center of the game. If they wish to mix the rhythm of the rain with the other cool sounds, please press OPTION button to choose chirp pig, growl zombie, thunder, chicken, or more. Definitely, the players will create lots of awesome melodies. Let’s become a DJ musician and bring different electrical sounds of the rain to the world. Do you have many cool ideas to mix the above sounds together? Don’t waste your talents, guys. Play this Minecraft Free game and other 2d Minecraft Games Online Free to feel how great they are and get more interesting ideas. 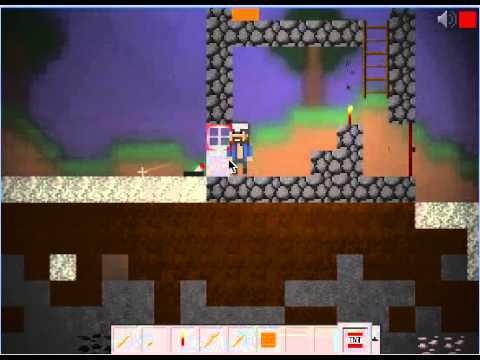 Come on and take your little time to enjoy a wonderful version of 2d Minecraft games online free – Mine Blocks 1.25. Many fantastic structures will be built here if you are a creative guy. Let’s see how awesome your desired constructions are. Like other Minecraft creative games, this version also requires the skills of building, decoration, and creativity. The more imaginary players are, the more beautiful the world is. It’s time to explore its 2D world and start locating your impressive land. Look! The world is full of colorful flowers and fruit moon trees. Besides, many cute animals lurk around. That is a cool land for you to live there, right? The first job is to mine necessary blocks such as sand, dirt, rocks, coal, cobblestones, stones, wood, and so forth. Then, set up lots of the high buildings, mansions, and castles. Do not forget to build your desired house on the nicest place. Interestingly, the players can go down and build the structures from the earth or the ocean. Next, they keep collecting the wood to craft some stuff like tables, chairs, carpets, and beds. Furthermore, they can create a garden or a farm. Hunt some pets to feed, guys. Wow! It’s interesting to take care of them in the garden or the farm. Finally, grow more flowers around the constructions. This job is one of the most important one because you cannot be creative, your desired world is not beautiful as you expected. It takes much time for you to create a nice scene around the structures. after planting the colorful flowers into groups or lines, please keep putting some saplings and trees to make the world grateful. Enjoy Mine Blocks 1.25 and other Games Like Minecraft on 2d Minecraft Unblocked Games to get fun! Move with arrow keys. Build with the mouse. Minecraft games are present a lot on Interest. Sometimes, you feel confused about which one you should play. That is why today I want to show you a cool site which includes wonderful game genres. Actually, you have many choices to choose them and relax. Don’t miss the chance to visit 2d Minecraft games. All exciting features and points are here for you. If you want to check that, play Cool Math Minecraft Creeper Diamond. Want to test how fantastic your game controlling skill is? It is certain that your will be improvable increasingly after finishing Cool Math 2d Minecraft Creeper Diamond game. Hurry to prove your talented skills now. Everything in the game is completely different from others because this is the deadly adventure you cannot make sure you will be alive or not while performing your task. Let’s understand that you are in the death, and to keep you living during the journey, you must be smart, agile, and wise. Once you can handle sudden issues well, you can beat the game easily. Find it out now! In the game, the key task of players is to climb on the top of a terrible hill to gather sparkling diamonds. Look! Do you see they are twinkling over there? Find the wise way to reach them. Totally, the game requires your talented skills, agility, and wisdom to solve the sudden matters successfully. Once you are confident in those talents and brave, don’t wait anymore. Take action and aid a little creeper to complete his desire of collecting those valuable diamonds. Look! He is at the bottom of the hill. What will you do to take him through hazards and reach the target soon? Well, let your talents answer that. This time, players must be intelligent when guiding the creeper to the hill. There are many challenges and dangerous monsters on the road. Be watchful for them to avoid the death. 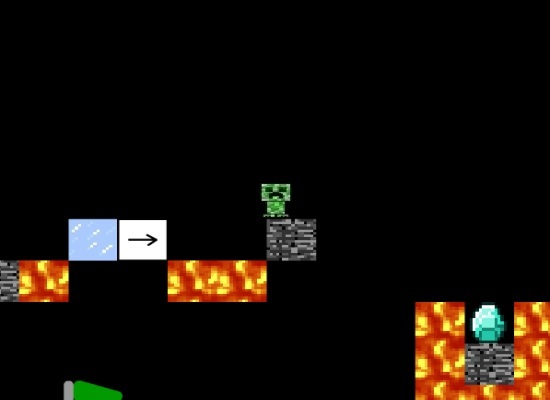 The creeper faces with lava lakes and arrow blocks. Never let him drop to those deadly lava lakes as well as stand on the arrow blocks so long, or he will go back to the latest checkpoint where there is a checkered flag, and try to start that stage again. Play many others on 2d Minecraft games and have fun, guys! Control the creeper with the arrow keys. Jump by spacebar. Shooting games are popular in 2d Minecraft games. But, there are 2 newest ones you should play. They are Minecraft Minesweeper and Minecraft Themed Shooting Gallery. Let’s find out their secrets now! Now, go to check how fabulous you are while defeating all tricks of dreadful creepers in a cool shooting game – Minecraft Minesweeper. Hurry up to test your talented skills. It is certain that your shooting skills are more improvable after finishing it. Let’s see what is wrong with Minecraft world. As you know, this world is awesome and has a great environment condition for anybody who lives here. It’s the reason why all creepers desire to conquer all wonderlands. Look! There are many dreadful TNT blocks placed on fields. However, it is hard to determiner their positions because they are hidden under squares. Come on and find them before the creepers destroy the whole world. 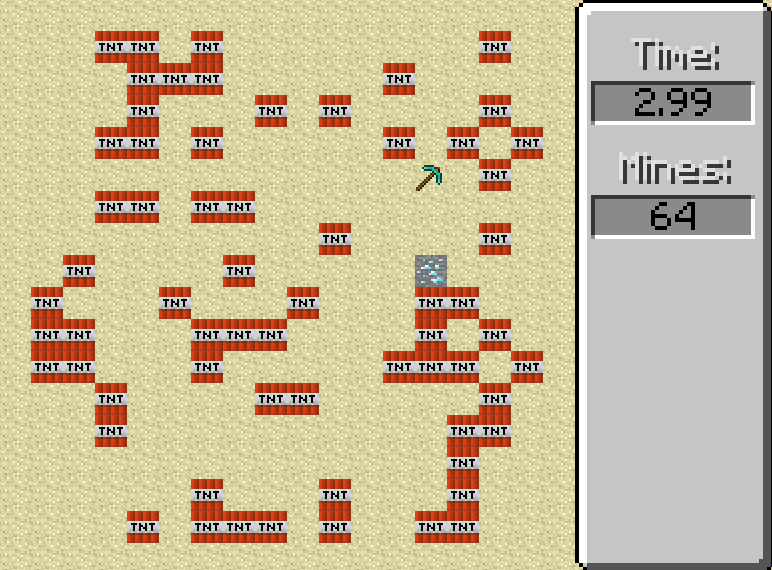 The sooner you explode these TNT blocks, the safer everyone is, and the higher the score is. Select any mode to begin your mission of saving people from the explosions. It may be Beginner, Easy, Medium, Hard, or Extreme. Try to be smart and wise to gain the best result. You just click on the squares. Once clicking on any TNT block, all of them on the field will appear at the same time. Take a glance at the board on the right hand of the screen to see how long you finish the mode and how many TNT blocks you have found. After enjoying Minecraft Minesweeper, how is your shooting skill? Is it better? Take more time to play Minecraft Themed Shooting Gallery and check how more rapidly you can shoot. The players will be a gunner of the Minecraft world to aid people here to repel all deadly enemies from their own world. At the moment, many creepers are entering this world to determine it. They have already planned to hide hordes of TNT blocks everywhere. As the chance comes, they will boom the whole Minecraft world. That is why you come and taken all their tricks down. The field is full of the TNT blocks. The players must go around and find them. Explode them before they destroy everything. In level 1, they will find 3 TNT blocks in their shortest time. In the second level, the task is more challenging than ever. They will fight against three creepy bosses. Look! The creatures are walking on fields. Shoot them in your best time. The sooner they explode TNT blocks and monsters, the higher score they get. Level 4 is the most interesting one for them to prove their shooting skill by destroying as many of the TNT blocks they can. In addition, you can play other Shooting 2d Minecraft Unblocked Games to test your shooting skill.